All our Refurbished Large Telephone Systems are PROFESSIONALLY tested, repaired and cleaned with NEW handset cords and line cords. Our large refurbished telephone systems look almost new and ready to be installed in your business office. Our certified phone technicians fully inspect every refurbished handset so we can guarantee our 1-YEAR WARRANTY commitment. Telephones Online Pty Ltd deal with the leading brands in the industry including Siemens, Samsung, NEC and Alcatel to guarantee maximum product quality to our customers in order to avoid high maintenance and service costs down the track. Customers have the option of selecting numerous pre-configured packages, as well as the opportunity to configure their system personally, tailored explicitly to their particular large business organisation needs. We offer a range of Business Refurbished Phone System to suit many company sizes. We do not make any pretence that the product is new, but aim to ensure our Refurbished Phone System, together with the full 12 month warranty, provide a real alternative to the new Phone we stock. We test all large refurbished phone system equipment prior to install ensuring they are fit for purpose, which means you have the assurance that they are ready to use in your business and all features are fully functional. In fact, we won't even program the system until our certified phone technician has discussed with you your requirements, to ensure all works perfectly. Does my large business need a PBX phone system? Well it may just do, but that doesn't mean it will break your budget! If you can't justify the expense of a new system right now, refurbished phone systems are the easiest way of getting the features your business needs, without the cost of brand new. Refurbished phone systems are just like that, in perfect working order with a 12 months warranty. TelephonesOnline.com.au can also work out a payment plan if required, to make that refurbished phone system for large business even more accessible. By purchasing a large refurbished phone system you can reduce your costs by up to 50% in some cases. Request a quote today from one of our Sales Managers to see the difference. Well it all depends on how old the large phone system is, if its 4-8 years old, most advanced features such as direct indial, voicemail and conference calls are available and can be installed on a large refurbished telephone system. Talk to our Sales today about your requirements and we can have it installed by the end of the week! At TelephonesOnline.com.au we provide a full range of Large Refurbished Phone Systems and cards & accessories for the systems. Our Large Refurbished Telephone System give a discounted alternative to customers, without compromising on the quality and reliability of the equipment we sell. 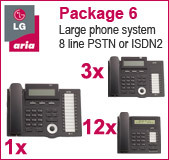 Simply follow the links above to find your Large Refurbished Phone System & SAVE! Refurbished Business Phone System - SAVE $1000s! Your business communication can be as simple and functional as you desire, we specialise in customising the perfect solution for you! Large businesses require a Refurbished Phone System that makes communication simple, affordable and reliable. At Telephones Online Pty Ltd we understand your needs and take the extra step to customise the simplest options and design a business Phone system to match all your business needs within your budget!